Sts. John Cassian and Germanus, celebrated in the East on 29 (or 28) February and in the West on 23 July, are among those “pilgrim saints” who journeyed a lot during their lives and knew the realities both of the eastern and western Christian world of the 4th-5th centuries. 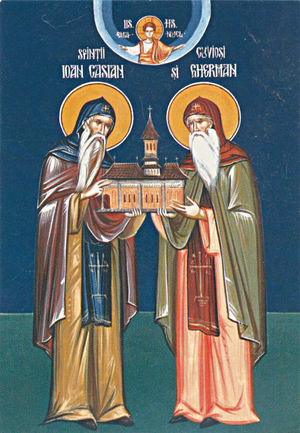 John Cassian and German were friends from their childhood. The year of their birth and the place are not clearly known, but it may be around 360 in Scyhia, a province in the northern Balcanic Peninsula between Danube and the Black Sea, also known today as Dobuja, the easternmost part of Romania. Although there is no mention about this place in the writings of John Cassian, this hypothesis comes from a mention of Genadius of Marseille, an apprentice of St. John. In his De viris illustribus 62, the Gaul bishop speaks about the Scytian ancestry („natione Schytha“) of John. The hypothesis is accepted both in the Catholic and Orthodox Churches, although there are some scholars to understand the demonym “schytha” as a reference to the Scetic Desert from Egypt, where they lived among the desert monks for a while, or maybe an allusion to Scythopolis (Palestine). Some others hypotheses about the origins of the two are superfluous here, including Provence or even Syria. In any case, some mentions in the works of Cassian suggest the birth in a wealthy family, and a classical education, Latin being his mother tongue. Saint John mentions in his book Collationes that he and Germanus were brothers “not by birth, but by spirit” (Coll. 16,1). About in 378-380 the two, together with Cassian’s sister, made a pilgrimage to Bethlehem. The latter remained for the rest of her life in a nun monastery here, but the two friends remained just for a while in a cell near the Church of the Saint Sepulchre. During this time they have heard about the ascetics in Egypt so they decided to visit the monastic communities there. After about three years in Palestine, they journeyed to the desert of Sketis and Nitria situated West by the Nile Delta (probably 384-394) and visited numerous monks there, with whom they had the “interviews”, later written in Collationes. At the time, the Scetic Desert was divided among the “anthropomorphist” monks, the adepts of the literal interpretation of the Scripture and the “’origenists”, who preferred the allegory and accepted some other theories of the Church Father recently passed away, such as the theory of apokastasis, or even the pre-existence of the souls. The dispute between the two parties consisted in the fact if the contemplation of God may be seen as a material act, with other words, if the ascetics may see God, is God material “after the image and similitude of the man”, or even more, the act of contemplation is due the man or due the divine grace? The ascetic and theological ideas promoted by Cassian in his works suggest that the two Scythian monks knew some “origenist” monks, probably Evagrius of Pont among those, with whom they shared the idea about the seven capital sins (in fact 8, by Cassian) and the triple ascetic life consisting in purification (purgatio or catharsis), illumination (illuminatio or theoria), respectively deification (unitio, or theosis). The fight between the two ascetic visions ended about 15 years after John and Germanus came here. In 399 the “antropomorphists” helped by patriarch Theophilus of Alexandria, started a war against the “origenists” who fled in other locations. Together with the most known “origenists”, the so-called “Long Brothers”, John and Germanus left Egypt and went to Constantinople, where they appealed the archbishop St. John Chrysostomos for his protection. In the meantime Cassian was ordained deacon and Germanus priest, and they became members of the clergy from the capital city. There is a hypothesis that Cassian took the name of John just in this period, in honor of his protector. Anyway the attacks of Theophilus went further against the “origenists” and St. John Chrysostomos was condemned and deposed after the Oak council (404). One of the accusations was the fact that he accepted the origenist teachings as well. The Latin-speaking Cassian left Constantinople for Rome in the next year together with Germanus, where they tried to find support for Chrysostomos, pleading his cause before Pope Innocent I. After this moment there is no other mention about Germanus, so he might died in this period. Another possibility is that Germanus went later with Cassian together in the monastery of Marseille, or even that he came back home in Scythia. During the Roman period, Cassian met the future pope Leo the Great, with whom he bound a friendship for the whole life. After a new rise in the East, in Antioch and Palestine (where probably he was ordained priest; after other sources, only after his return in Rome), he received the proposition to establish himself in Gaul and to found there a monastery after the rules he have seen in Egypt. This thing happened around 415, when he arrived in Marseilles and founded the Abbey of St. Victor, a complex of monasteries for both monks and nuns. The church of the monastery was built on the grave of a martyr from the 3rd century. In any case, the monastic life was brought in Gaul not by Cassian. The asceticism in Provence existed already through the abbey of Menerfes founded by Bishop Castor of Apt and the one in Lerins, led by Bishop Honoratus. 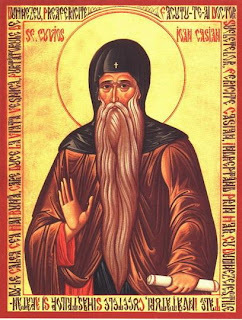 But the special merit of St. John Cassian is that he brought the Egyptian monastic discipline in the West, and his monastery served as a model for the later monastic development in the western Christianity. The achievements and writings of St. John Cassian influenced St. Benedict, who took some of the main ascetic principles in his monastic rule and recommended the reading of the Cassian’s corpus of writings. In Marseille, St. John Cassian started to write his well known works. Around 417-418 he published the Monastic institutions (De institutions coenobitorum et de octo principalium vitiorum remediis libri XII), at the request of Castor, bishop of Apt and the future Pope Leo I. This work deals with the organization of the monastic communities, discussing about clothing, prayer and rules of the monastic life (the first 4 books) and about morality and the eight vices and their cure (gluttony, lust, avarice, hubris, wrath, envy, akedia and boasting - in the books 5 to 12). Some years later (after 420, but no later than 426) Cassian wrote his “interviews”, also known as “Conferences”, or “Collationes” (, that means, vesperal meals, in Latin: Collationes Patrum in scetica eremo), dedicated to the archdeacon Leo, the bishop of Frejus and the monk Helladius, and who deals with “the training of the inner man and the perfection of the heart”, being in this way the second part of his work, the first being a “corporeal” training. This second book receives some completions around 426 - 429 (books 18 to 24) addressed specially to the hermit monks. Finally, in 430 St. John wrote his third book, On the incarnation of the Lord (De incarnation Domini contra Nestorium libri VII), at the request of the archdeacon Leo, the future Pope Leo the Great. Its text may be seen as a preparing text for the third ecumenical council, dealing with the doctrine of Nestorius and mentioning about the title of Theotokos given to the Virgin Mary. All the writings of John Cassian are in Latin; subsequently they were translated into Greek for the use of the monks, which is a great privilege and honor, no very often met in the Old Church. The most important teachings of St. John Cassian consist in his triple ascetic vision about purification, illumination and deification, which has been later taken into the later catholic theology about the three ways. During the first level, the monk struggle against the most “material” sins and against the desire through his ascetic life. Later, during the illumination he practices the holiness revealed in the Gospel through the teaching received from God in his Sermon on the Mount, based on the exercise of love. The final stage of the unification with God (theosis) is rarely received by a monk and described after the union of marriage from Canticum. This stage is usually accompanied with the refuge of the monk in solitude. Another notable teaching of John Cassian implies the soteriology. He opposed Pelagius, who believed that the human receives the salvation through his own struggle, without the divine help, but also he dissagreed Augustine, who emphasized the importance of the original sin and stated for the absolute need of the divine grace in starting a holy life. Cassian adopted a middle point of view which was later condemned as semi-pelagianism, because he stated in some of his conferences that the first steps in salvation are in the power of the individual, without the need of God’s help (Conferences: book 3: with Abba Paphnutius, book 5 with Abba Serapion and book 13 with Abba Chaeremon). This position was condemned about 100 years later, at the local council of Orange (southern France) in 529, when the Augustinian theory was accepted as the normative soteriological theology for the Catholic Church. In any case his theory is accepted as normative in the Orthodox Church, who interpretes his theology quite differently, as not contradicting the work of the divine Grace in any of the phases of the human struggle. St. Cassian died in 435 in Marseille and was buried in the church of St. Victor Monastery he built. His relics are kept until today in an underground chapel of the monastery, during his skull and right hand are in a reliquary in the main church. About St. Germanus there is no more data after the two friends came to Rome in 403. The saintness of John Cassian was generally recognized in the Church since the beginnings. In 470, when Genadius compsed his De viris illustribus, he named John Cassian as „sanctus Cassianus”, a title used by many popes speaking about him, such as St. Gregory the Great in a letter addressed to the Abbess Respecta from Marseille (PL LXXII, col. 866), or Benedict XIV who wrote that there is not permitted any doubt about his sanctity (De canonizatione sanctorum II, 29). He is also included in the Gallican and the Roman Martyrology on 23 July. Even if not included in the general Calendar of the Roman Catholic Church, the local Church of Marseille celebrates his feast day on 23 July, during the Eastern Orthodox Churches usually on 29 February in the bissextile year, or on 28, in the rest years. 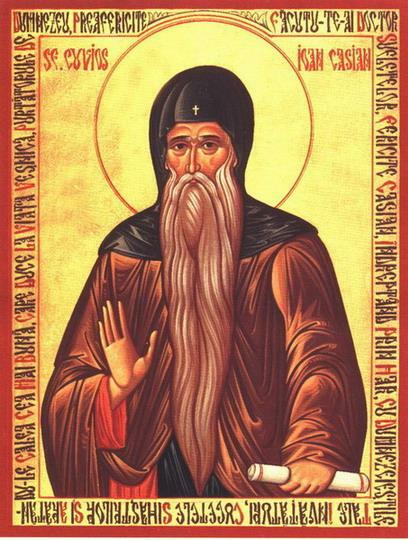 The Orthodox Hermeneia of Dionysios of Furna, a Greek theologian and painter (17th-18th centuries) describes that St. John Cassian shall be painted as an old monk, with sharp beard, carrying in his hands the inscription: "Too much sleep come together with the lack of abstinence, during the watchfulness rather sends away the naughtiness, such as the smoke [rushes] the bees [and, such as a fire burns]." The image of God was truly preserved in you, O Father, for you took up the Cross and followed Christ. By so doing you taught us to disregard the flesh for it passes away but to care instead for the soul, since it is immortal. Therefore your spirit, venerable John Cassian, rejoices with the angels! You concerned with thy labors, with unremitting vigils, with prayer and fasting, Blessed Father Germanus, along with St. John Cassian, coming from the land of Dobrogea, and you worthly received the flows of the priestly grace through the prayer of John Chrysostom. You have earned by your zeal wealth of spiritual gifts from the Holy Land and therefore you made worthy many people to follow Christ. Therefore, Father of Dobrogea, pray Christ our God to save our souls! 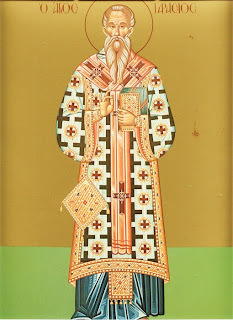 Saint Tarasios, patriarch of Constantinople (784 - 806) is known in the Church history as the one who leaded the ecumenical synod which conducted to the re-establishment of the icons cult in the Byzantine Empire, being celebrated on 25 February. The most important source about his life is the Life of Tarasios written by Ignatios, his deacon and secretary. Another source is the Chronicle of Theophanes Confessor and the life and the correspondence of Saint Theodore of Studion. Tarasios was born in Constantinople around 730, being the son of the eparch Georgios and his wife Enkrateia. 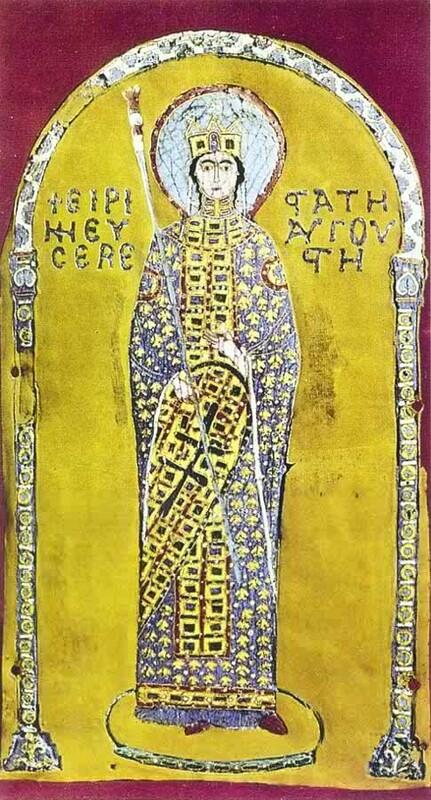 At the time when Constantine VI and his mother, Irene took the throne of the Byzantine Empire (780), Tarasios was a functionary in the bureaucratic apparatus (protasekretis) of the imperial court. Later he attained the rank of senator, and finally became imperial secretary (asekretis) to the Emperor Constantine VI the Porphyrogenetos. The Eastern Empire was at the time influenced by the oriental iconoclastic doctrines, imposed by the Isaurian Dynasty, came from the regions at the borders with the new Islamic world. The iconoclastic fight was with no means easier than the one of the ancient Roman emperors against the Christians. The ikonodouloi (defenders of the icons) were beaten and even killed, and many churches were vandalized. The Church in Rome refused to remain in communion with the patriarch of Constantinople, who at that time was a partisan of the official politics. Only after the death of Leo IV (775/780) and the beginning of the reign of his minor son Constantine VI (780/797) under the regency of his mother, Irene, the situation of the icons started to change. The latter iconoclastic patriarch Paulos IV repented for his former iconoclasm and resigned of his throne (31 August 784), living as a simple monk. In this situation, the empress called a local council at her palace of Magnaura and after consulting the former patriarch, the people and the noblemen, she decided to propose Tarasios for this position, who at the time was a simple layman. The Chronicle of Theophanes reproduces the discourse of Tarasios who refused, but anyway he let himself convinced. Nevertheless, like all educated Byzantines, Tarasios was well versed in theology, and the election of qualified laymen as bishops was not the first in the history of the Church (similar cases being St. Ambrose and probably St. Nicholas of Myra). Tarasios accepted the function on condition that church unity would be restored with the other Patriarchates and Rome, and that it will be held a synod for the restoring of the icons. During the next days he was ordained deacon and then priest. The consecration as bishop and patriarch was held on the Christmas day in 784. As patriarch, Tarasios persuaded Empress Irene to write to Pope Hadrian I, inviting him to send delegates to Constantinople for a new council, in order to repudiate the iconoclastic heresy. The answer came on 26 October 785. The pope argued that the election of a layman as patriarch was against the canons, but finally he accepted the situation, in order to reestablish the ecclesiastical communion. The Pope agreed to send delegates, and it was convened that the synod will be held in the Church of the Holy Apostles on August 17, 786. During the last preparatory reunion, on 31 July, in the absence of the patriarch some rebel soldier troops, faithful to the former iconoclastic emperor Constantine V, distorted the calm and insulted the bishops and monks chasing them away. Anyway the patriarch and the empress maintained their position to hold the council. The situation repeated during the inaugural seating. Tarasios and the Abbot Plato of Sakkoudion (the mentor of St. Theodore of Stoudion) have held discourses, but they couldn’t go with the chaos created by the soldiers. Later, the mutinous troops were removed from the city: the empress motivated the danger of a Muslim attack and sent them in Asia Minor, bringing instead some favorable troops from Thracia, known as iconodules. The situation still did not make possible the synod, which was held only a year later, starting on 24 September 787 in the cathedral of St. Sophia from Nicaea, and not in the capital city. The synod is recognized as the 7th Ecumenical Council or as the Second Council of Nicaea. Even if called as usually by the emperor, no crowned head participated to the reunions. The Patriarch served as acting chairman of the 365 reunited bishops who condemned the iconoclasm and formally approved the veneration of icons. The official closing of the reunion happened on 23 October in the Magnaura Palace, the residence of Irene. Tarasios and Irene accepted easily the re-integration of the formal iconoclastic bishops who repented and to all those who promised they will change their opinions. This clemency was strongly criticized by the monks from Stoudion, the strongest partisans during the iconoclastic disputes. In any case, the politics of the Patriarch made that in the next period there wasn’t any iconoclast resistance. Seven years later Tarasios involved in the controversy started by Constantine VI who divorced his wife, Maria of Amnia, accusing her of trying to poison him. Tarasios approved tacitly the situation and the constantinopolitan monks were scandalized by the patriarch's consent. Abbot Plato of Sakkoudion and his nephew Theodore the Studite were exiled because of their position, but the uproar continued. Much of the anger was directed at Tarasios for allowing the marriage of the emperor to Theodota, although he had refused to officiate himself. Only later, after Constantine VI lost his throne in favor of his mother (18 august 797), and under severe pressure from Theodore, Tarasios excommunicated Joseph, the priest who had conducted this illegitimated marriage. The last years of his patriarchate were marked by a new usurpation. 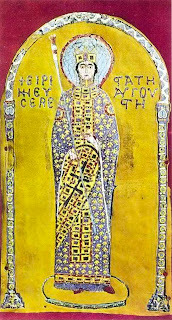 Nikephoros, a patrician from Seleucia, appointed finance minister by Irene, contrived to dethrone and exile Irene, with the help of the patricians and eunuchs. He was chosen as Emperor in her stead on 31 October 802, and Tarasios crowned him against the public opinion, doing later the same with Staurakios as co-emperor in 803. Tarasios had had a weak personality, but he served the three imperial regimes of Constantine, Irene and Nikephoros with loyalty. Anyway, his reputation suffered from criticism of his alleged tolerance of the elected bishops through simony, although he published an official document condemning this practice. In spite of these weak organizational skills, Tarasios lived a very austere life and spent his money on God-pleasing ends, feeding and giving comfort to the aged, to the impoverished, and to widows and orphans. Every year on Easter, he set out a meal for them, that he served himself. He commanded the building of a monastery on the European shore of Bosporus Strait which later took his name. He died on 25 February 806 and was buried in his monastery. 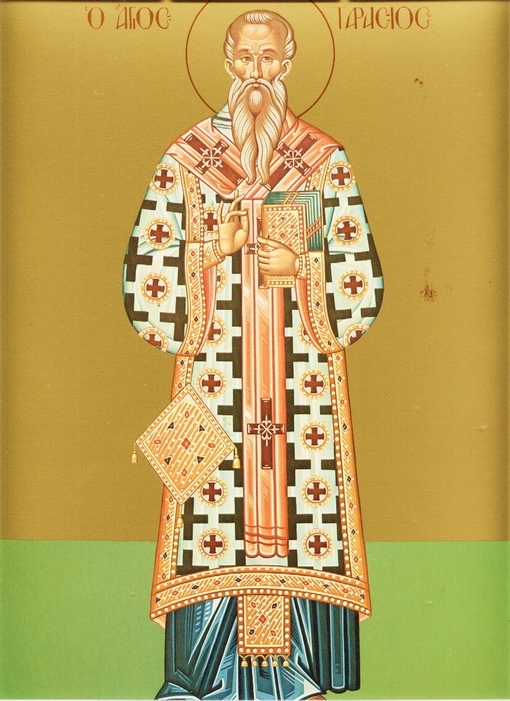 Though some scholars have been critical of Tarasios’ weakness before imperial power, the patriarch was revered in the Eastern Orthodox Churches for his defense of the use of icons, and his struggle for the peace and unity of the Church. His feast day is celebrated on February 25 both in the Eastern and the Western Churches. You shone forth as a light of the Spirit, adorned with an exemplary life and clothed in hierarchical vesture. You stilled the turbulence of heresy and became a pillar and foundation of the Church, which praises your struggles, holy Father Tarasios!